We offer many services, but our amazing granite countertop renewal Jacksonville service is one of our premium services. Granite countertops are an investment and a beautiful accent to any home, whether it’s in the kitchen, bathroom, family room or even outdoors. 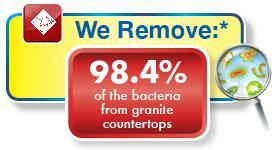 Granite that is cleaned and sealed often can keep the germs and bacteria away. True, there are many do-it-yourself products available, but these can often do more harm than good. Most contain harsh or abrasive ingredients that can actually damage the granite and make the finish appear dull. If you want your granite to keep it’s brand new look, you’ve come to the right people! We’ve tested the effectiveness of our Granite Renewal Process in multiple homes and found that our Granite Countertop Renewal process, in conjunction with a sanitizer, removes an average of 98.4% of bacteria from granite countertops! You can trust Zachary’s Chem-Dry when you want to refresh and revitalize your granite countertops for a cleaner surface, brighter shine and a healthier home. Because granite is very porous, it can harbor bacteria and dirt that can only be lifted with deep cleaning. That is exactly what we do! After we deep clean, we then seal the surface to keep unwanted elements away, which helps restore the shine and extend the life of your granite countertops. We only use green certified cleaning solutions that are safe and non-toxic with strong deep-cleaning equipment to safely remove the dirt and build-up. 2. Remove Leftover Residue. Once we’ve cleaned the surface, we’ll remove any residues from the granite countertop with our Granite Countertop Residue Remover. 3. Seal. Once deep cleaned, the countertops will be sealed with a small amount of our Granite Countertop Sealer. Our sealer will dry quickly, in 3-5 minutes. The Sealer penetrates the granite surface leaving you with a powerful layer of protection for your countertops. 4. Polish. Finally, we polish the countertops. We use our unique Granite Polish that will leave your countertops shiny and refreshed for you to enjoy for months and years to come. 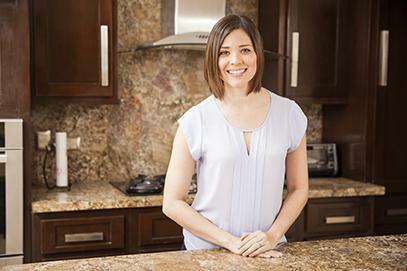 For the best granite countertop renewal, Jacksonville has to offer, call Zachary’s Chem-Dry today at 904-620-7310! *Based on studies conducted by independent laboratories of Chem-Dry’s HCE (Hot Carbonating Extraction), P.U.R.T. (Pet Urine Removal Treatment), Granite Countertop Renewal, and Tile, Stone & Grout cleaning processes. All bacteria results include use of sanitizer. Figures are an average across multiple tests.